We are pleased to present the first ever, Prometheus Platform. The platform is extremely strong and rigid, able to hold over 500lbs during testing without failure. Storage space inside the stand can hold (2) 500 count berger bullet boxes, powder cans, dies boxes, etc. Stands are CNC Laser cut, precision welded, then cleaned and sent off for premium automotive grade powder coat. Stands are able to be wall mounted or hard mounted to your bench reloading top with the included hardware. The supplied hardware kits include everything you need, hardware wise, to perfectly level the stand. Leveling feet may also be purchased. The leveling feet are extremely high quality and able to support 525lbs per foot as rated by the mfg. Each foot has a rubber non skid pad and is able to swivel as well. Leveling feet kits are available for purchase for an additional $29. 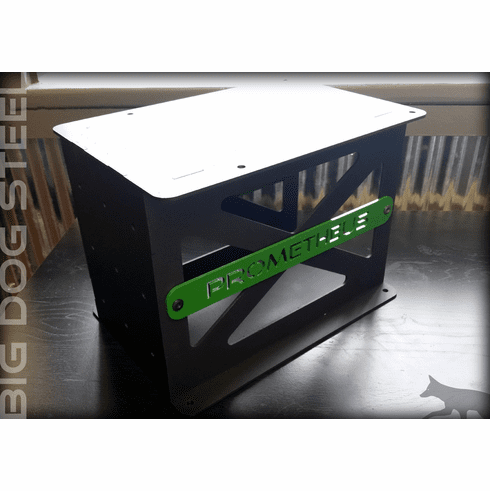 Each Prometheus Platform kit includes either a wall or bench top mount that you can specify at the time of purchase. Additional wall or bench mount kits are available for $9. Big Dog Steel will be holding a Group Buy starting today 08/29/15 @ 5pm EST. They will be available for purchase directly on our website. During the Group buy you will able to purchase the platform kits at the reduced price of $179. Shipping will be calculated at check out. We anticipate shipping the first units in 3-4 weeks. After the Group Buy ends units will be available for purchase from Impact Precision. Each platform will be carefully wrapped and packaged in a heavy duty cardboard box. All platforms will ship UPS Ground with the proper insurance. You will receive tracking info when the item ships.